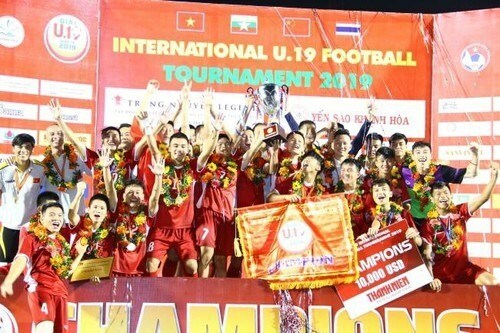 Khanh Hoa (VNA) - Vietnam’s team have won the U19 International Football Championship after beating Thailand 1-0 in the final in Nha Trang city, south central Khanh Hoa province. Striker Pham Xuan Tao scored the only goal for Vietnam in the 60th minute. It was the second time Vietnam have defeated Thai rivals in a week after the U23 squad secured a 4-0 victory over Thailand in Group K of the Asian U23 Championship qualifiers. Thailand started the game well, clearly irked by the country’s earlier defeat, but with great support behind them, Vietnam defended well and managed to take control of the game during the first half. Vietnam finally broke the deadlock in the 6th minute. Long Nhat’s long ball put Tao through on goal and he rounded Rakyart in the Thai goal to coolly finish into an empty net. Tao, who finished the tournament joint lead scorer and most valuable player, thought he had doubled Vietnam’s lead in the 75th minute but his effort was judged offside. As the clocked ticked, Thailand did have chances to get back into the game but were denied by the woodwork and brilliance of Vietnamese keeper Quan Van Chuan, who was named goalkeeper of the tournament. As well as lifting the trophy, Vietnam also picked up the Fair Play award.